Lovin That! : Energize or Deplete You? This is a very simple formula that kinda works with every aspect of your life. 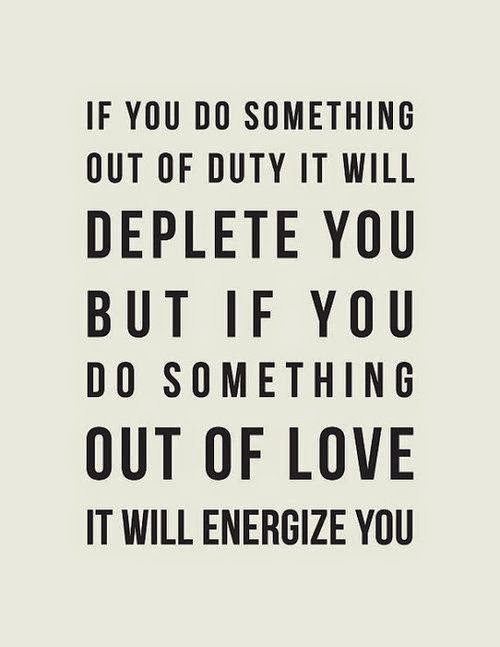 Does something Energize or Deplete you? As someone who used to spend a lot of time on the Deplete side of things, I can tell you this makes a big difference. It's really all about energy. When I first really got this and probably the easiest way to test it out is with people. When you are around someone and leave the situation do you feel a bit better or like you need to go have a gin and tonic? If it's the latter, take note. When you do an activity, attend a class, a certain part of your job - we can notice where we feel a little bit lighter. Saying no is very hard. I have a very common disease as I know many of you do as well - 'the need to please disease.' But what I'm slowing (and when I say slowly, I mean like a turtle) I am finding the more I can say yes to what feels like a 'Hell Ya' and leave the other stuff I am more focused on what really matters, find time for what fulfills me and feel fuller on the inside. Don't get me wrong, every time I say that dreaded 'NO' word to something I brace myself as if the world may start crumbling. But so far, the world has kept on going (kidding of course on this) and it actually starts to feel like a world of more freedom and choices. For the next week, let's all try and do the things that energize us and see if it makes a difference. Go with your gut, go with your feelings. If it fills you up, do it more. If it makes you feel a little less, try and do it just a little less.